Back in the 17th century, through to the early 18th century, the Spanish throne had been held by the House of Bourbon and, during this time, due to a predominantly militarist strategy, had acquired much overseas territory across the Atlantic ocean. For many years, Spain held jurisdiction over large parts of the southern United States, Mexico, Central America and South America, not to mention some Caribbean islands. In 1759, a new king was crowned - Carlos III. Europe in general at this time was experiencing the so-called "Age of Enlightenment", which was a movement towards the advancement of knowledge, promoting science over superstition and encouraging free speech and religious tolerance. Carlos indulged in what was termed "enlightened despotism", or "enlightened absolutism", which simply meant that he embraced this new concept of enlightenment wholeheartedly. 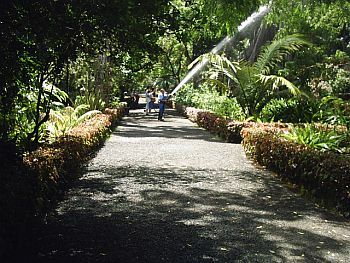 Before you start to think, what's all this got to do with Puerto's Botanical Gardens, we come to the point of this introduction. Carlos decided, in 1788, that he wanted some of the exotic plants, flowers and trees from his territories in South and Central America brought over to adorn his palace in Madrid. Trouble was, the flora needed a stop-off point to become acclimatised to their new environment. 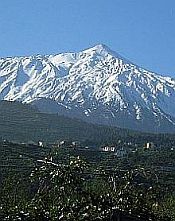 The Canary Islands, with their sub-tropical climate, seemed the ideal choice, so Carlos drew up a Royal Decree on August 17th of that year declaring the establishment of an "acclimatisation garden" in Puerto de La Cruz. Although known officially as Jardín de Aclimatación de la Orotava, or "JAO", this installation is actually in Puerto de La Cruz (there is a smaller one actually in La Orotava). Since its inauguration, all those years ago, it has become one of the most important botanical gardens in the world, rating alongside such others as Kew Gardens in London. It is a huge place, covering around 20,000 square metres. If that wasn't enough, plans are underway to double its size, with the addition of landscaping and more modern facilities. Many exotic tropical and sub-tropical plants are to be found within its grounds. One of the main exhibits has to be the Coussapoa Dealbata, a tree from South America, unusual in its mass of intertwining trunks - looking like something out of a horror film. There are around 50 different species of this tree and this one has to be one of the most spectacular. 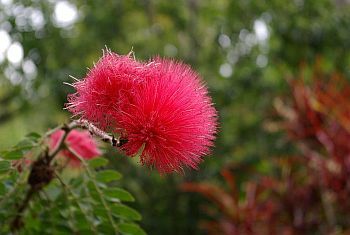 Many exotic tropical and sub-tropical plants are to be found within its grounds. One of the main exhibits has to be the Coussapoa Dealbata, a tree from South America, unusual in its mass of intertwining trunks - looking like something out of a horror film. There are around 50 different species of this tree and this one has to be one of the most spectacular. As you can tell from the size of its grounds, the garden can take a good while to explore fully. It is easy to spend half a day there! 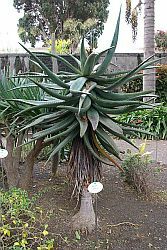 Other exotic species include palm trees, bromeliads (if you don't know what these are, the pineapple is one), aroids (with an orchid-like appearance), aloes, mulberry and fig trees. The imposing entrance to the gardens is found on Calle Retama, which can quite easily be accessed from the TF-5 north motorway. Exit at junction 32 (signed the TF-31). Take this TF-31 heading for Puerto de La cruz. Eventually, leave this road where the sign says TF-312, El Botanico. This road takes you into the very upmarket area of La Paz and you'll eventually find yourself driving alongside the gardens, on your right. Taking the next turn will get you to the entrance, where there should be room to park. 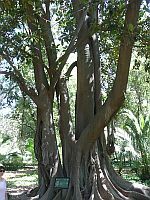 The Gardens also boast a library and a "herbarium" devoted specifically to Canary Islands flora. Academics may visit both these for research purposes, by appointment only, between the hours of 9am and 1pm, weekdays.